The CMX655D integrates two matched channels with Digital Signal Processing (DSP) along with a 1 Watt 90% efficient filterless Class D amplifier and support for digital MEMS microphones. These are functions that would have previously only been possible by adding additional components. In addition, the CMX655D design makes full use of advanced manufacturing processes, resulting in a device that requires very low power in all operating modes and is able to operate from a 1.8 V to 3.6 V supply as opposed to requiring 5 V to achieve a 1 Watt output power. These features make it ideal for battery-powered devices. The use of wired and wireless telephony is still increasing and voice codecs provide the crucial interface between a microphone and a speaker in any application that uses voice as an interface. While the smart phone industry has focused on multimedia codecs, the demand for higher quality voice outside this market is also increasing, as consumers become more accustomed to interfacing with advanced electronic devices using their voice. As well as the opportunity present for higher quality audio in telephony, the use of natural speech and audible feedback in devices such as home appliances and digital assistants is also on the rise, as manufacturers continue to make our lives ‘smarter’. To improve the user experience, manufacturers are increasingly turning to signal processing to apply digital filters to voice signals. This would normally require either a separate DSP or a high-end microcontroller (MCU). Now, thanks to the CMX655D’s integrated DSP functionality, OEMs can remove the external DSP or specify a low-end MCU instead. 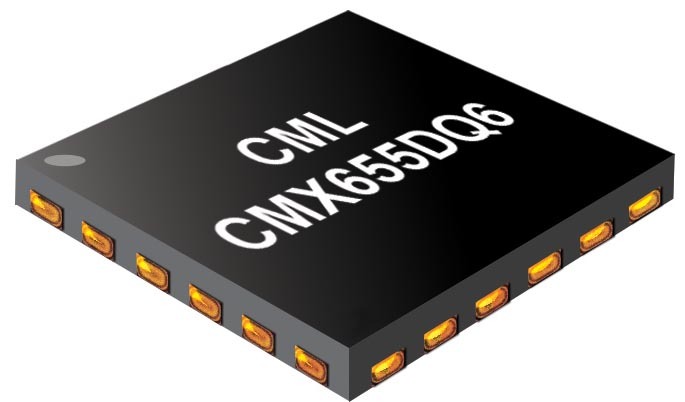 The ultra-low power operation of the CMX655 requires around 500 µA for all microphone path functions, as opposed to a few mA that an alternative codecs require. Delivering higher functionality at significantly lower system power is a major development for the industry. Its low power and high level of integration will enable manufacturers to add high quality voice to a wider range of applications, such as intercom-based door entry units and other security systems, smart home appliances and voice systems in the home, workplace and factory. It will also offer significant benefits to existing telephony applications. The CMX655D features two independent microphone channels capable of operating in full duplex mode while maintaining relative signal phase, enabling one device to support two-way communication while simultaneously applying echo cancellation, for example. The voice filters offered by the DSP include 300 Hz – 3.4 kHz for classic telephony and 50 Hz – 7 kHz for High-Definition audio, while all signal paths supports audio bandwidths up to 21 kHz at sample rates of 8, 16, 32 or 48k samples/s. As a traditional telephony codec, the CMX655D supports A-law and µ-law companding. The two parallel channels feature completely separate signal paths but share a common serial audio interface, which supports I2S (the Inter-IC Sound serial bus designed for digital audio devices) as well as I2C and SPI interfaces for device control. Alongside its low power operation and high level of integration other features include programmable signal level detection, autonomous very low power voice detection, and noise gating. The speaker path has Dynamic Range Control ensures a constant volume at the output speaker even if the input varies. This can be a particularly useful feature in intercom or security systems. 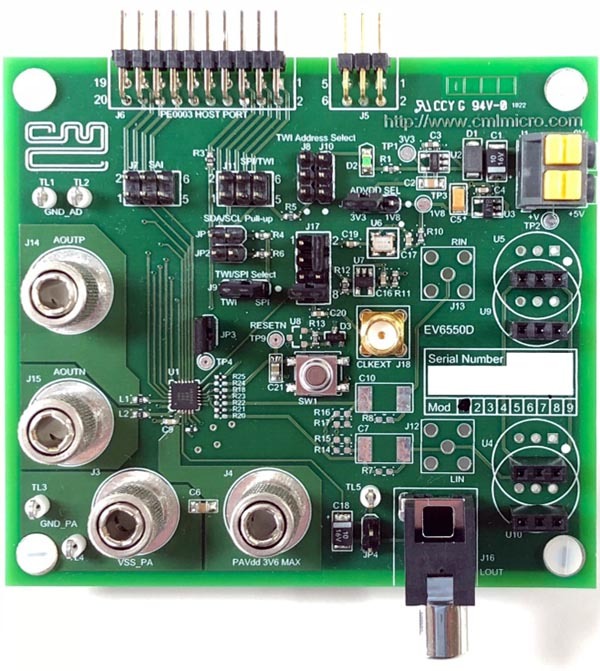 The CMX655D is supported by a wide range of development tools including the EV6550D evaluation kit and is available now in a small 4 × 4 mm QFN package.